The PM-3000 series is a range of powerful and advanced Smart Power Meters that give you access to real-time electric usage for single-phase power measurement. With its high accuracy (<1%, PF=1 ), the PM-3000 series can obtain reliable and accurate energy consumption readings from the monitored equipment in real time. These compact and cost-effective power meters are equipped with revolutionary wired clip-on CT (various types, support input currents up to 200 A). It operates over a wide input voltage range 10 ~ 300 VAC to allow worldwide compatibility. And with 2 channels of relay outputs, it can be linked with sirens or lights/indicators for alarm messages. 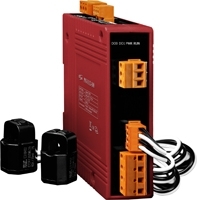 They are available in versions supporting Modbus RTU, Modbus TCP or CAN bus protocols for easy integration. NOTE: Installation must be carried out to any relevant standards by suitably qualified engineers. Compact Single Phase Smart Power Meter, 2 loops, ModbusRTU protocol. 60A CT's. Compact Single Phase Smart Power Meter, 2 loops, ModbusTCP protocol. 60A CT's. Compact Single Phase Smart Power Meter, 2 loops, ModbusRTU protocol. 100A CT's. Compact Single Phase Smart Power Meter, 2 loops, ModbusTCP protocol. 100A CT's.